This is the look and if you have it, people will never ask you what you do for a living – they’ll know. I have never understood why the rank and file of such a purportedly creative bunch would choose to have their appearance so easily defined. We have been typed and categorized with minimal effort by the public at large. My wife frequently points out that as soon as an architect deviates from this recipe, they are terrible dressers. I used to dispute her opinion but it is becoming harder and harder argue my case when the evidence at her disposal is so readily available. There is evidence to support that wearing such dominant glasses can help you “brand” your face by making you stand out and be more memorable. Sometimes the eyewear can become so ingrained into your look that this becomes the way you are defined. Use Le Corbusier as an example – it is impossible to think of him without those glasses. Phillip Johnson even had his signature spectacles made based on those worn by Le Corbusier. I consider architects to be rational radial thinkers. In the simplest of terms, it is because despite having programming and building codes to contend with, our solutions are still partially judged on their aesthetics. As a result, we approach a problem with no set solution and start working and compressing towards the center to find a balance between the function and the form. A little take here, give a little there, back and forth, over and over until the balance that we seek has been found. Do architects take the same approach to selecting their eyewear? 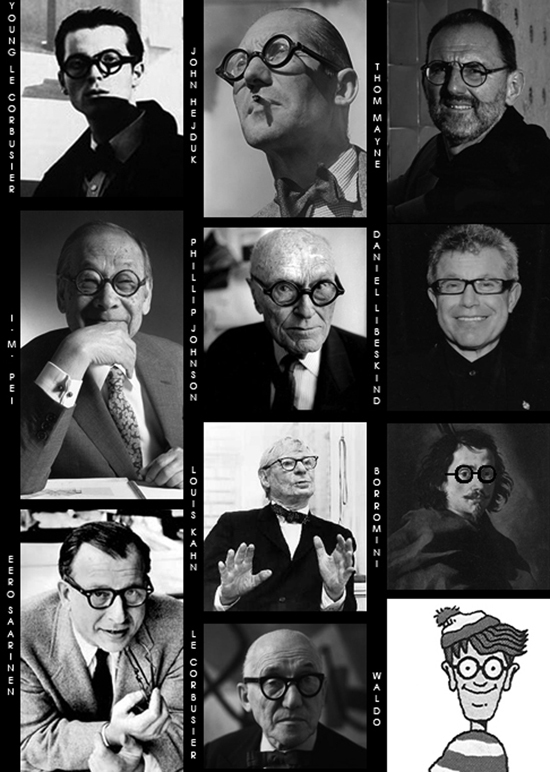 Do architects who choose “architect” glasses consider them sterile and functional or are they a fashion accessory? With today’s modernist architects re-upping to the maxims of “Less is More”, I would have to say the former. Do they consider, hair or eye color? What about the shape of their face? Are the lenses thick so as a result, the frames are structural? How about a color other than black? (Gasp! – I can’t believe I asked that last question…I imagine someone from the AIA is preparing a letter reprimanding me at this very moment). Most importantly, do they wear them when nobody is looking? These are not unreasonable questions and if we were talking about actual architecture rather than the look that seems to define architects, I would expect that every architect would consider multiple solutions to all these questions. Based on the evidence at hand, and I’m not entirely sure of this yet, but if your architect isn’t wearing glasses like these, they probably aren’t very committed.